Opened in 2006, our flagship restaurant, The Beef and Barrel Restaurant & Lounge is perfect whether you are celebrating a special occasion or simply want a meal out. 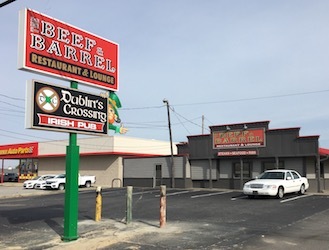 Upscale, casual dining at its best, the Beef and Barrel features daily lunch and dinner specials, soups made fresh in-house, hand cut steaks, tender baby back ribs, and delicious seafood, in addition to a fully stocked bar. Come see for yourself why the Beef and Barrel is “the best dining experience on the plateau, with the most variety.